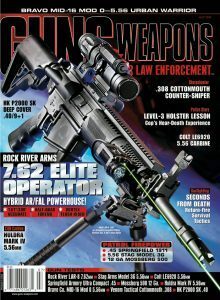 The front of the magazine well features enhanced grasping grooves machined directly into the aluminum for better handling. When it comes down to it, many LE officers who have to purchase their own equipment must look for top-noch performance at a reasonable price—not an easy combination. Recently, a new option has entered the market. Huldra Arms came about through the efforts of Mills Fleet Farm, a leading sporting goods retailer in the Midwest. Looking to enter the AR market and develop a line of gas piston-operated rifles, and after a tremendous amount of research and development, Mills Fleet Farm was convinced of the impressive characteristics of quality and performance of the Adams Arms AR piston operating system. The result was the Huldra line of ARs, a joint effort between Adams Arms and Mills Fleet Farm (which is the sole retailer for these rifles). Huldra Arms is currently offering four ARs. The test sample provided was the Mark IV 5.56 Carbine. In outward appearance the Mark IV Carbine resembles an M4 Carbine. It has the 16-inch barrel, collapsible buttstock, short oval handguard and flattop upper receiver common to that design. What it does not have is the fixed front sight. Even though the rifle will accept mil-spec parts, on the inside it is very different than your common M4-style AR. The main difference is the piston system, which uses the same gas port as a conventional AR to work the action, but with the Huldra, the gases that pass through the gas port are not directed back to the upper receiver and bolt group through a tube. Instead, they are used to drive a piston that has a small sleeve that fits over a rod at the rear of the gas block. The result is that all the gases are expelled from the rifle at the gas block and little to no gas or carbon fouling enters the action. Priced at just $999, the Huldra Mark IV should prove to be a popular choice with LE officers who want a good piston-driven AR. According to Huldra Arms, its AR functions and feels like a conventional AR but runs cooler, cleaner and more reliably. 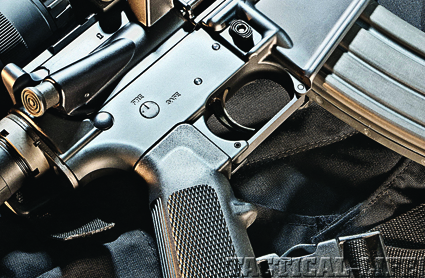 Piston-driven ARs are not new—other manufacturers offer them and I have tested several. With the exception of the Huldra, I could feel a difference in the way the rifles recoiled. I’m not saying this was a bad thing, just that it felt different. 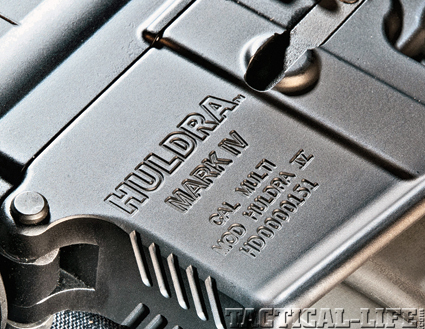 To me, the Huldra felt like any other standard gas impingement-driven AR. The piston-operated Huldra Mark IV, shown equipped with a Trijicon AccuPoint scope, may resemble an M4 Carbine on the outside, but it has plenty of features that set it apart. Another difference you will find with the Huldra is a bolt spring. Behind the bolt and inside the bolt carrier there is a small spring that surrounds the protrusion on the end of the bolt. This spring keeps forward pressure on the bolt at all times. Service members will remember that during training on the maintenance of the M16, they were told to push the bolt to the rear in the bolt carrier, and if it did not rotate and slide forward when they slung the bolt carrier outward, the bolt was not clean. With the Huldra bolt and bolt carrier, you cannot do this because of the continuous pressure exerted on the bolt by the bolt spring. According to Huldra Arms, the bolt spring eliminates cam pin wear. Because of this spring, the bolt assembly is a bit different as compared to a standard gas impingement-driven AR. When inserting the bolt key, you must hold slight pressure on the bolt to line up the bolt key for insertion. You simply cannot just drop the bolt key into the bolt carrier and bolt. I did find that the firing pin retaining pin on the test rifle was very difficult to remove. It was so hard to reinstall that I buggered it up in the process. I had to borrow a pin from another AR to complete the range testing. Aside from all this, the only other eye-catching difference with regard to the bolt assembly was the absence of a gas key at the top of the bolt carrier. In its place is a piston block that is flat on the front. This gives the piston a hard surface to pound against while cycling the action. Huldra Arms has taken specific care to protect all the internal components of the Adams Arms gas piston operating system. The gas piston system and block have been coated with Melonite and the bolt carrier is ion-bonded. 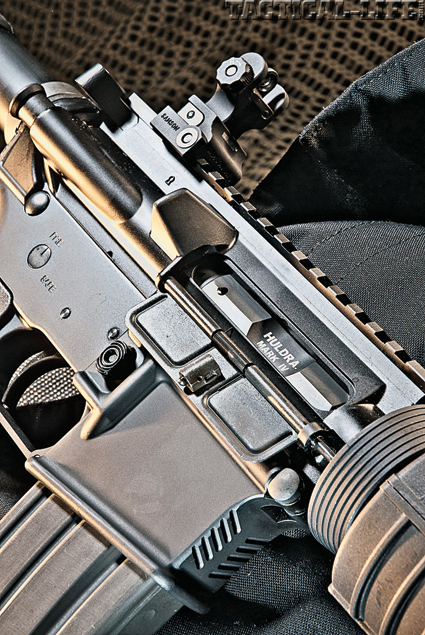 All piston system parts that operate Huldra rifles come with a lifetime warranty. 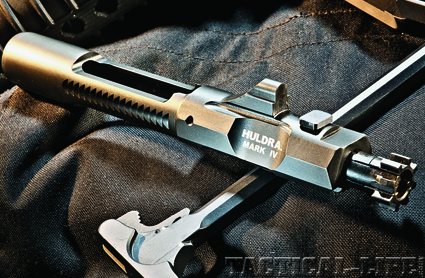 Upon close inspection, you will notice the absence of a gas key on top of the Huldra bolt carrier. In its place, there is a piston block. Huldra Arms believes that their piston system, combined with their bolt spring, eliminates carrier tilt. Carrier tilt is a common complaint, especially with piston-driven ARs. It’s where the bolt carrier not only moves to the rear while the action is cycling but it also slightly cants due to the impact and push of the piston against the piston stop on top of the carrier. Huldra Arms believes that the actual cause of carrier tilt is poor tolerances in the receiver, something they say does not exist in Huldra rifles. I cannot confirm or deny this, but I can tell you the rifle ran flawlessly through several hundred rounds, using various factory loads with bullets weighing between 55 and 69 grains. There were no signs of wear on the operating mechanism and the inside of the receiver was indeed very clean. The gas block that drives this mechanism, made of steel and almost 2 inches long, is positioned 7 inches forward of the receiver. The top of this block includes an integral section of Picatinny rail with four slots at the same height as the rail on the upper receiver. The front of the block has a knurled dial with a detent button under spring pressure that allows you to adjust the amount of gas used to drive the piston. You can turn this dial by hand. The adjustment dial has three settings. If you are shooting normally, adjust the knob so that the detent button is positioned straight up or at 12 o’clock. If you want to use a suppressor, set the detent button at the one o’clock position. And finally, for single-shot firing—where the action will not cycle—set the detent button at the three o’clock position. The adjustable gas block was not tested with a suppressor, but the rifle functioned perfectly in the normal and single-shot mode. For accuracy testing, I used three different factory loads from Black Hills, Remington and Wilson Combat. In my hands, using a 1-4x Trijicon AccuPoint scope with the post reticle, the rifle demonstrated that it was capable of averaging 1.5-inch five-shot groups from the bench at 100 yards. The best group fired was produced with Remington’s 69-grain Match load, and it measured 1.4 inches between the centers of the two holes that were the furthest apart. With 50 rounds downrange from the bench—five to zero and 45 used for accuracy testing—I loaded two 30-round Magpul PMAGs completely full and hammered off 60 rounds as fast as I could tug on the trigger. The Huldra purred along just fine. I say “hammered” because that is what I felt I was doing with the Huldra’s trigger. According to my trigger pull gauge, the trigger broke at 6 pounds. I personally found the trigger to be a bit gritty and have some creep to it. All that being said, Huldra informed me that based on their experiences, if the trigger is properly lubricated and live- or dry-fired, its feel will be greatly improved. I then dedicated myself to burning up the remaining rounds set aside for this test. 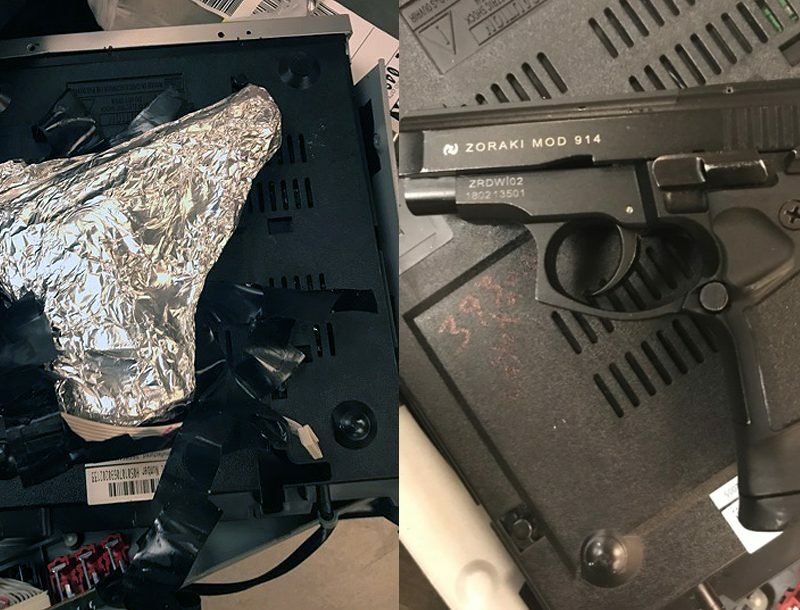 A full magazine was fired with the gas regulator set in the single-shot position and the other 60 rounds were burned up running the rifle through various drills. It’s no surprise that the rifle handled well. It is, for all practical handling purposes, like any other 16-inch-barreled AR carbine. I also tested the rifle with Samson folding front and rear sights. I liked these sights and they seemed rugged enough to survive harsh treatment like you would expect cops to dish out. For the last 60 rounds fired, I removed the Trijicon AccuPoint and reinstalled the Samson rear sight. These sights are easy to take off and put back on. All that’s required is a flat-tip screwdriver. The Samson sights also have their spring mechanisms completely concealed to prevent fouling from dirt. While Huldra Arms does not include the Samson BUIS front and rear with the Mark IV, they sell a “Huldra”-marked set for $186.99. Overall, I liked the Mark IV and believe that Huldra Arms, in conjunction with Adams Arms, has engineered a very reliable adjustable piston-driven operating system. 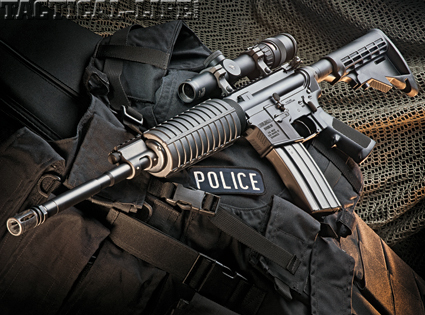 Aside from the trigger, these rifles should be assets to any police department armory. Given that law enforcement officers are notorious for not cleaning their guns—I know this because I worked as police firearms instructor for a dozen years—the clean-running piston system is a plus. 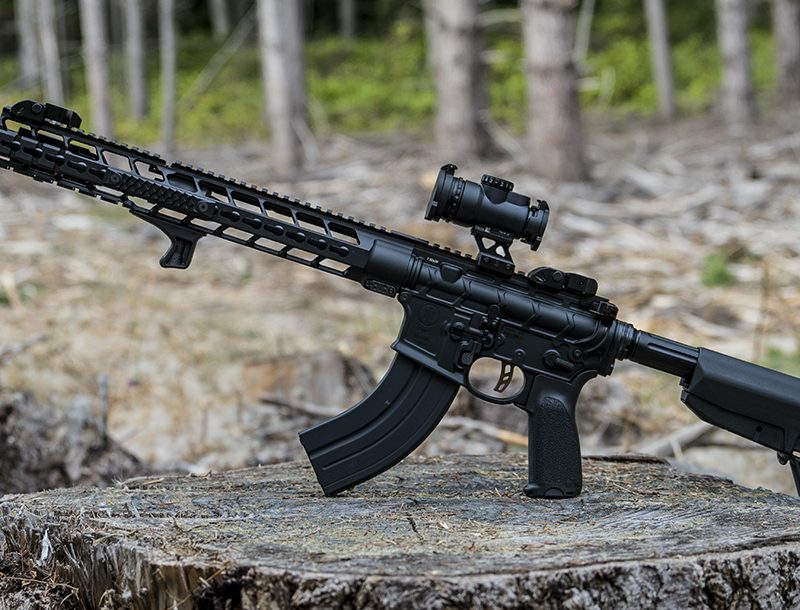 At a $999 suggested retail price, it is competitively priced as far as piston-driven ARs go. It’s definitely worth a closer look.